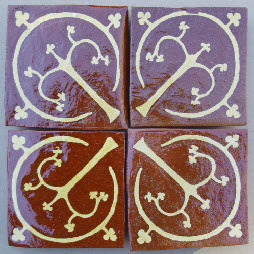 These replica Medieval floor tile designs are faithful to the originals, dating from the mid thirteenth to mid sixteenth century. I carve a pattern block from wood for each design and the stamped impression is filled with a slip inlay. The final colour is determined by the strength of the honey glaze, which I vary to recreate the variations found in the original wood fired ceramics. All thick floor tiles are 4.5 inches or 11.5 cm square approximately. Thinner ‘wall tile’ style tiles are slightly smaller. These tiles will vary in size slightly because they are hand made items! I create copies for museums for displays and my tiles are also bought by people for their homes. Thicker floor tiles are suitable for fire hearths and floors, thin wall tiles are made in all designs. Tiles that create using my own designs. It all started with a shamanic floor…a commission for a shamanic, organic restaurant in Nottingham in 2000. I drew each tile design onto the clay and carved it out, then filled it with slip, shaved it back and dried it, then fired it, glazed it and fired it again. Each tile could take a day to carve. My inspiration came from drawing animals and a love of collecting shells and feathers, as well as making dream catchers which incorporate these objects. It was a very powerful design when the floor was finished and in place, the largest thing that I had ever made. This was my first commission – something of which I am very proud. If you would like to discuss a commission, please contact me. I can also work in other colours of slip in a white background clay, or use other colours of glaze. 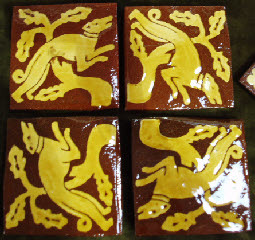 ‘Running Hound’ Kent c1280 – 4 tiles together make the dog run round.